Johann van Graan’s side are in control of their own destiny as they look to book their place in the quarter-finals, but come up against an in-form Castres side at Thomond Park. Munster need another big Thomond performance today. MUNSTER HAVE BEEN here before, the third weekend in January fighting for their European lives. And so their hopes hang in the balance as the Red Army enter make-or-break territory once again this lunchtime. 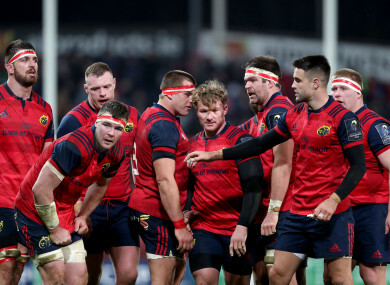 On a weekend when it’s easy to get carried away with permutations and predictions, Munster are at least in the position of entering their final Pool 4 clash with Castres at Thomond Park [KO 1pm, Sky Sports] knowing exactly what needs to be done. The equation is rather simple, although achieving it may not be as straightforward as many are expecting; a victory of any kind for Johann van Graan’s side would seal their place in the quarter-finals while a bonus-point win by more than five points would guarantee them home advantage in the next round. And all the odds are stacked in their favour. On countless occasions before Munster backs have been against the wall, but time after time they have been able to dig deep and produce the performance and result required. And they rarely lose at their Thomond Park citadel. All of that is even before you consider Castres’ poor record away from home, although the French side have arrived in Limerick with an outside chance of spoiling the party and going through as pool winners. For that to happen, the Top 14 outfit — who notably have won seven of their last eight league games to rise to fourth, as well as thumping Leicester Tigers last weekend — need to win here, deny Munster a losing bonus-point in the process and hope the Tigers can do them a massive favour by beating Racing 92 at Welford Road. Van Graan is wary of the threat they pose, warning that this is no foregone conclusion, particularly when the visitors have made a strong selection for their visit to Limerick, including a recall for leading try-scorer David Smith and a familiar face in South African-born French scrum-half Rory Kockott. “They have big forwards, a very good kicking game, a left-footed out-half,” Van Graan said earlier in the week. “They don’t have a long kicking game, they put you under pressure with a good chase, a very good maul. You need to stop their maul. But these situations often tend to bring the best out of Munster, and it is a major fillip to have Peter O’Mahony fit to lead the fight after there were concerns over the captain’s fitness following last week’s defeat in Paris. In fact, Van Graan has named the same side as last week and the hosts will look to assert their dominance in the key areas from the outset, including the scrum and lineout with the weather in Limerick set to be wet for the afternoon. Key men in red are in good form, too. The set-piece looks strong at present while the meaty midfield partnership of Chris Farrell and Rory Scannell perfectly complements the back three of Keith Earls, Simon Zebo and Andrew Conway. Discipline will be another area of focus for the southern province and if they can stay on the right side of the referee — Ben Whitehouse, for what it’s worth — they will go some way to dominating the breakdown and the overall tempo of proceedings. Munster begin the day sitting top of the pool, a point ahead of Racing, and in fifth in the quarter-final standings following the conclusion of three pools yesterday, with their final positioning to be determined in some way by results elsewhere. But the picture will be clear for O’Mahony and his troops as they leave the home dressing room just before 1pm in the knowledge that the quarter-finals beckon if they can produce another rousing Thomond performance. Win-or-bust? Munster are experts at getting it right when it matters. Email “Munster's European hopes hang in the balance as they enter make-or-break territory ”. Feedback on “Munster's European hopes hang in the balance as they enter make-or-break territory ”.